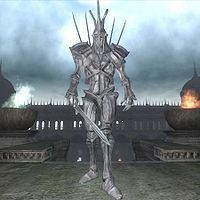 Jyggalag is the Daedric Prince of Order and the primary antagonist of the Main Quest. As the leader of the Forces of Order, he attempts to invade the Shivering Isles every era, an event known as The Greymarch. 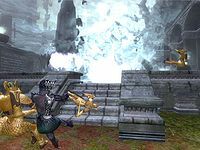 Since Jyggalag has never been unsuccessful in his invasion, the Greymarch always ends with the total destruction of the realm, leaving Jyggalag and the Forces of Order to disappear and Sheogorath having to restore his realm. You are chosen by Sheogorath to act as his champion, who is to stop the Greymarch and therefore save the realm. 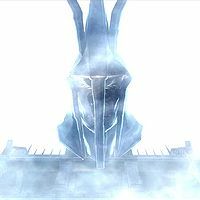 Sheogorath will add: "The Daedric Prince of Order. Or biscuits... No. Order. And not in a good way. Bleak. Colorless. Dead. Boring, boring, boring. And not a fan of My work, I can tell you. Hates it. Hates Me. A bit single minded, if you take My meaning. You've seen his Knights. Not the warm and cuddly sort. Not a bit of original thought in their lifeless husks. So, you're going to help Me stop him." 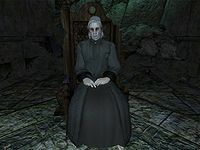 Sheogorath's Chamberlain, Haskill, will add: "The Daedric Prince of Order, and the leader of the Greymarch. As I'm sure my Lord told you, Jyggalag has always been a threat to this Realm." Comparable to Mehrunes Dagon in Oblivion, Jyggalag doesn't show up until the final quest in the Main Questline: The End of Order. Esta página foi modificada pela última vez à(s) 13h23min de 3 de dezembro de 2014.